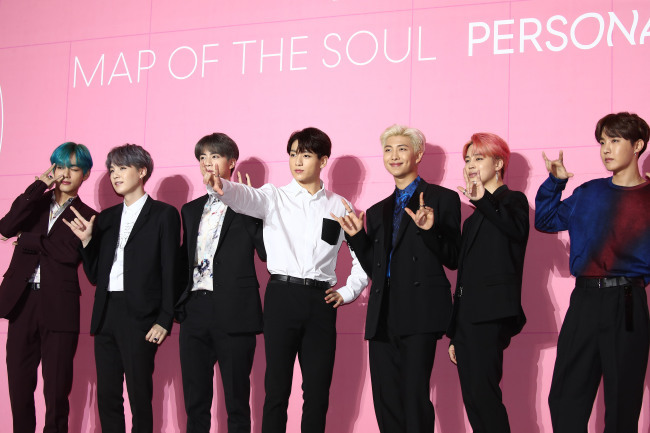 Having made an incredible splash on the music scene with the new chart-topping album “Map of the Soul: Persona,” BTS wants to delve into the power of love, which is what catapulted the band to global stardom, the band said Wednesday. At a global press conference livestreamed on YouTube, the septet talked about their new music, their collaboration with pop heavyweights Halsey and Ed Sheeran, their upcoming sold-out stadium concerts, their recent “Saturday Night Live” appearance and the weight of stardom -- all while expressing love for their global fandom community, known as the BTS Army. Jungkook also emphasized the unique relationship between BTS and its fandom community as the foundation of the new album. The new seven-track album, released Friday, is already breaking records. The EP is bound to top the Billboard 200 chart. It will be the third time the septet has made it to the top of that chart, having done so twice last year with “Love Yourself: Answer” and “Love Yourself: Tear.” The group is also set to top the UK’s Official Chart -- a first for BTS or for any Korean act. When asked about these trailblazing feats, the bandmates said that behind the confident, self-assured performances they felt the weight of their stardom. The lyrics of the new album also deal with this burden and with the negative side of the band’s massive popularity. “As we go up and grow in height, our shadow gets longer,” said RM. “So the pressure is always there. At some point, I became scared of the shining lights and the spotlight audiences. The audience can see me in bright, and I couldn’t. There were times when I felt like I wanted to run away. The new album is a star-studded one, with pop star Halsey collaborating on “Boy With Luv.” BTS will perform live with Halsey on May 1 at the Billboard Music Awards, where the band has been nominated in two categories: Top Social Artist and Top Duo/Group. In terms of what’s next for BTS, the bandmates said they were excited about their upcoming stadium tour of major cities in the US, Europe and Japan, and about hopefully taking a trophy home at the Billboard Music Awards.